A SpaceX Falcon 9 rocket launches the NROL-76 satellite for the U.S. National Reconnaissance Office on May 1, 2017. This rocket's first stage is scheduled to help loft the GovSat-1 satellite on Jan. 30, 2018. Update: SpaceX has scrubbed today's (Jan. 30) planned GovSat-1 launch attempt in order to replace a sensor in the second stage of the company's Falcon 9 rocket. The next launch try could come Wednesday (Jan. 31) at 4:25 p.m. EST (2125 GMT), company representatives said. Original preview story is below. SpaceX is pressing another pre-flown rocket into service today (Jan. 30) for a satellite launch that you can watch live. A two-stage SpaceX Falcon 9 rocket is scheduled to launch the GovSat-1 communications satellite at 4:25 p.m. EST (2125 GMT) from Florida's Cape Canaveral Air Force Station. You can watch the liftoff live here at Space.com, courtesy of SpaceX, or directly via SpaceX's website. This will be the second orbital mission for this rocket's first stage, which also helped launch a spy satellite for the U.S. National Reconnaissance Office in May 2017. The booster came down for a pinpoint touchdown after that liftoff, but there will be no landing attempt today; this Falcon 9 first stage is part of a crop of boosters that was designed to fly just twice, according to Florida Today. Future iterations of the Falcon 9 first stage will be able to fly at least 10 times, SpaceX founder and CEO Elon Musk has said. SpaceX has already launched five pre-flown Falcon 9 boosters to date, all of them successfully, and landed first stages on 21 separate occasions. 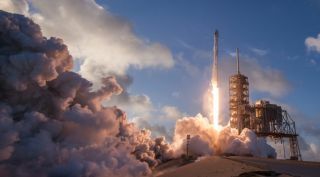 These activities are part of the company's effort to develop fully reusable spaceflight systems, a key priority for Musk. GovSat-1 is a joint venture involving the government of Luxembourg and the commercial-satellite company SES, which is headquartered in the small European country. The spacecraft was built by the American aerospace company Orbital ATK.